Day 2 in the Birthday Banff week had my tired legs back in the car for another full day of skiing, this time at to Lake Louise Ski Resort. 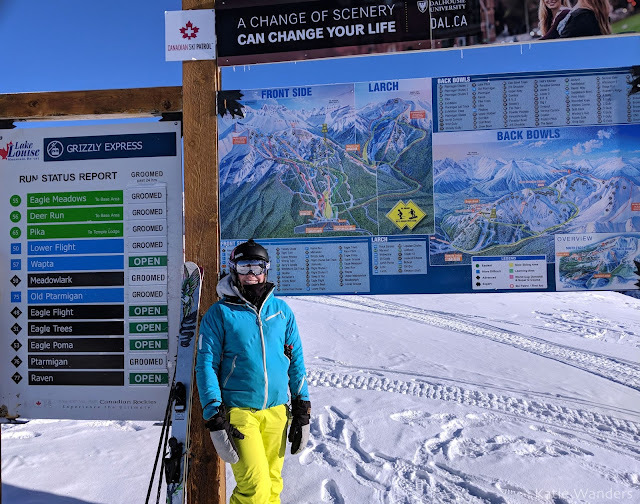 Not only was I excited for another day of on the ski hill, but I was going to check out a new area of Banff and truth be told the area I was most excited to see - Lake Louise. Lake Louise Ski Resort is about a 45 minute drive from downtown Banff, traveling northwest along the Trans Canada Highway. 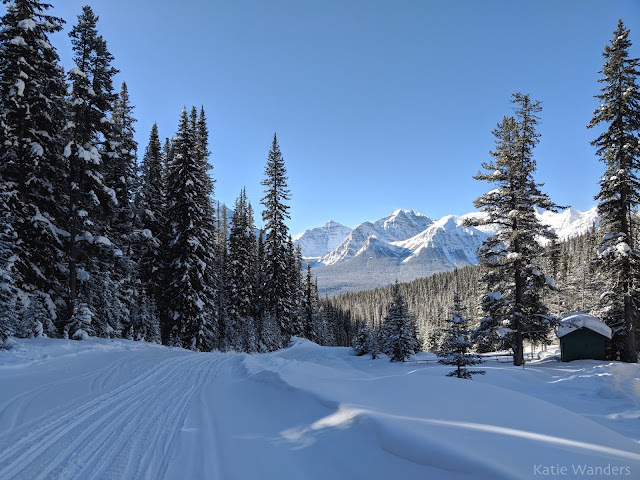 While the farther trip required an early bed time and earlier alarm, the ski resort is located just a mere 3 km from the lake, meaning you can knock off two activities in one day. 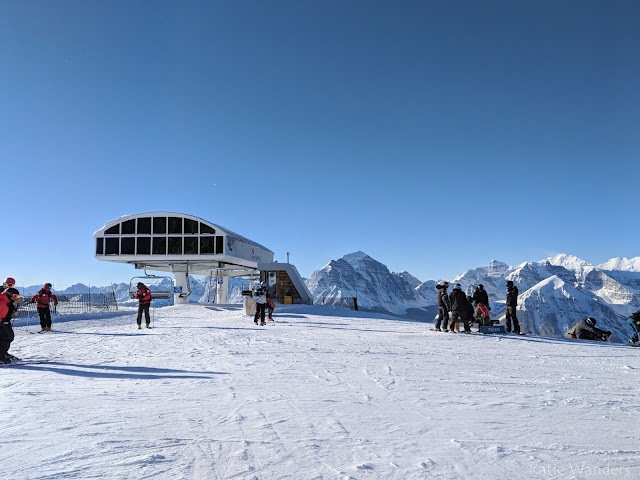 You can skate in front of the Fairmont chateau on a frozen lake and ski the beautiful mountain and ski resort in the same day. Winter dreams do come true. If I thought the views from Sunshine were spectacular, then I was stunned by the vistas from Lake Louise. Not only did we the most amazing backdrop I had ever seen on a ski mountain (yes, surpassing sunshine) but we had a crystal clear day ahead of us. I am saying not-a-cloud-in-the-sky-see-for-miles type of clear that comes with those high pressure cold systems the Canadian Rockies is oh-so familiar with. To start the day, we rode the gondola up the mountain offering us incredible views of the Canadian Rockies. At the top of the gondola, we skied over to another chair to head to the "Top of the World". At the top of this white dreamy world is snow covered jagged peaks as far as the eyes could see. So many times throughout the day I said to myself "I can't believe these are the views while skiing". It is that kind of view that is so amazing you think that someone could have just fooled you and this was a fake backdrop pulled down from the heavens. I spent so much time staring at those rocky mountains and a whole lot less focused on my skiing. 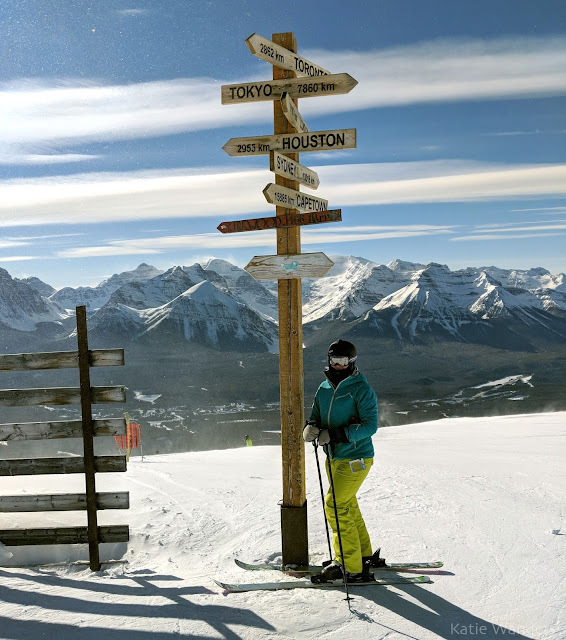 Once we soaked in the views and accepted that this was reality, we skied around the various sections of the mountains, assessing runs, snow conditions, and the layout of the mountain. There were your typical runs, mostly open, some steep. One thing I really loved was how the runs felt so long, not your typical ski down and back to the lift line. It took a while to get down some of these long runs from top to bottom. There was the section of back bowls that was open and separate, that reminded me of Snowbirds famous Mineral Basin, famous for its fluffy powder. Oh and the food? Finally, this lodge had good food (bison-ramen-with-a-view good). Speaking to a fellow skier on the gondola, she told me that yesterday was overcast and cloudy and the view non existent. Another friendly skier, one who worked on the mountain told me days this clear can be rather rare. On that cold clear Thursday (heavy emphasis on cold), I could see the peaks stretching before me and the beautiful Fairmont Chateau perched at the edge of Lake Louise. Turns out you don't have to go too far to feel like you are whisked away in a European ski town. Alberta, Canada will do the trick. Not everything was perfect and for the sake of being partial, Lake Louise was not as open as Sunshine and the snow was not as great as we had experienced the day before. And then there was the cold. The negative something bitter freeze that causes instant pain the second you remove your gloves. At one point we both complained of brain freeze as a tiny gap had been exposed between goggles and ski helmets. This was surely a "no exposed skin" sort of day and with the proper attire you could still be out there skiing and enjoy it. Sure it was cold but let me tell you- the views, the sunny skies and the long runs and fast lifts is what made this such a great day. 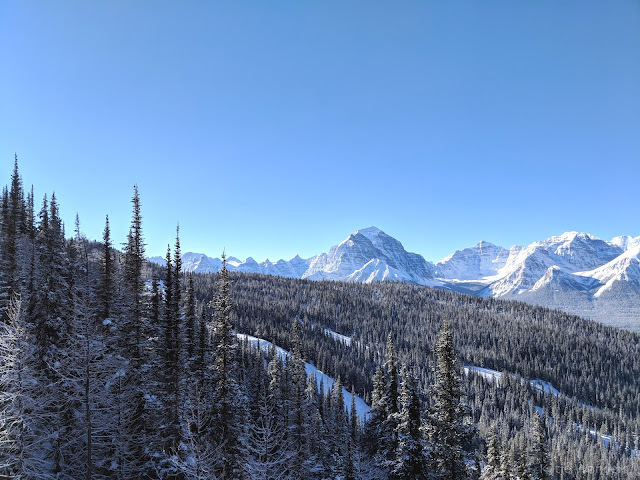 I would suffer through those bitter temperatures to spend another blue bird day on this mountain. I also love how these mountains use numbers and names on their trail. It is much easier to remember "53" than ""Ptarmigan Chutes ". The number system made getting around these mountains so much easier. My only gripe? A lift they labeled the "Summit platter". If you want to hit the summit of this mountain, its going to be a platter tow bar style lift for you. And on a seriously cold windy day we decided to skip that lift altogether. 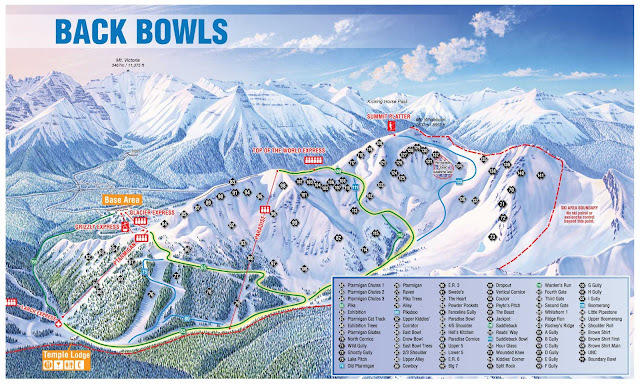 If you need some suggestions on where to ski or what trails cant be missed -you an find some recommendations here. To avoid dragging along an angry snowboarder as I did for a full 30 minutes, I will warn about the dangers of a certain trail at Lake Louise. Every ski mountain has that one green trail that ends up being so flat (and even uphill) that you spend a ton of your time in the middle of the woods strapping in and out, wondering when this flat hell is going to end. Manageable for skiers with poles - tough for snowboarders. Lake Louise has that trail and its the green run connecting Larch to the other mountains. On the plus side, the scenery on this trail was absolutely beautiful and we saw very few people making the trek (and the ones we did see looked to be as miserable as Thatcher did on his snowboard). I embraced the views and realized I was going to be doing a little more cross country skiing than I anticipated. This trail ended at the top of the tubing area and I quickly asked the lifty working the tubing area if guests received medals for surviving that brutal traverse. He said no but urged me to leave the comment in a suggestion box. Consider this my suggestion Lake Louise, that run is in dire need of a magic carpet or some magical downhill element to help get you across. In the resorts defense, the views and quietness on this trail was something out of a movie. You are in for a treat and some terror if you take this trail but alas - you have been warned. One of the things I loved most about this mountain was actually how much the people here loved this mountain. 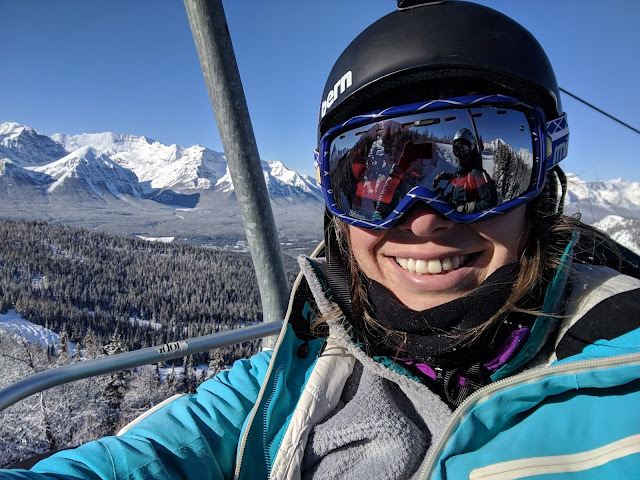 I talked to several skiers who loved Louise so much they had never even made the trek over to Sunshine or Norquay. Lake Louise had a following of fanatics and I can see why. 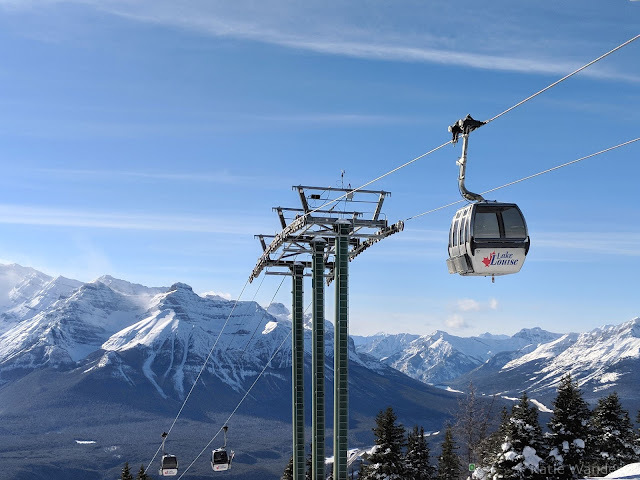 November 2017 - Lake Louise Ski Resort has again claimed the title of "Canada’s Best Ski Resort" for the fourth time in the last five years in the prestigious World Ski Awards. 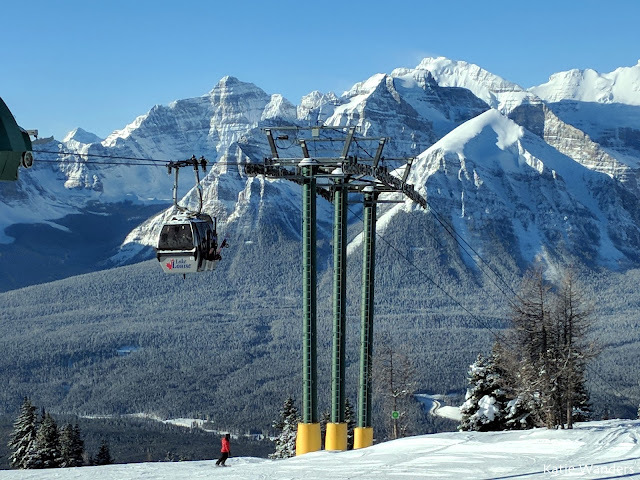 This friendly giant of Canadian ski resorts also placed in the top three “Worlds Best Ski Resort” and “Worlds Best Freestyle Resort” categories. For a quick snack break (they close at 3pm) we decided to end the day with some ramen at Kuma Yama ramen, sushi bar, and lounge. 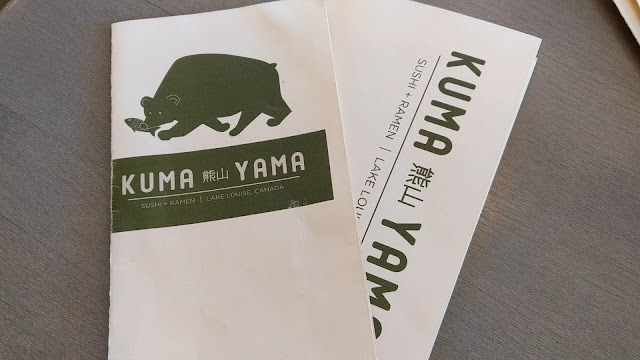 Kuma Yama is located on the upper floor of the Lodge of Ten Peaks in a gorgeous space with great views of the mountain. 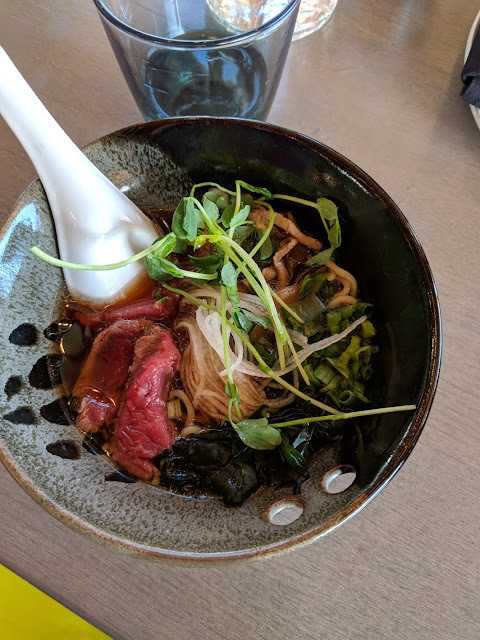 We decided to split the bison ramen - a perfect warm mid ski snack and a fantastic ramen to boot. Rare bison and great noodles in a fantastic broth loaded with veggies - definitely the primo lunch spot at Lake Louise. 2. The Powder Keg Lounge within the Ten Peaks Lodge is open until 6pm. 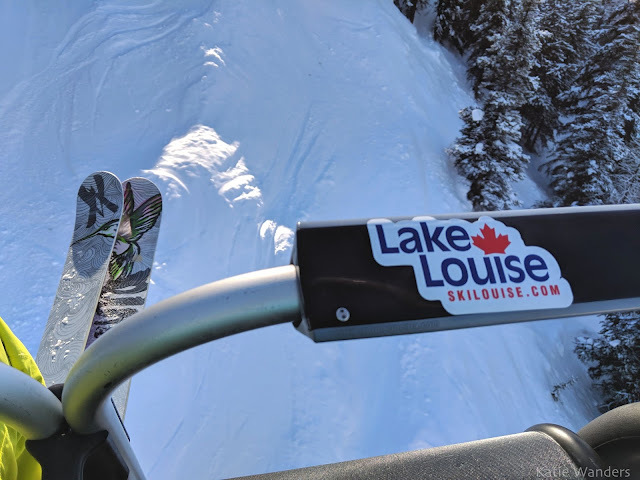 When I sat down and thought about Lake Louise and Sunshine Village, it was so hard to pick a favorite. These two are such different mountains and I experienced them on completely different days in terms of snow conditions, temperature, visibility and weather. Sunshine was open with fresh powder and tons of bowls. Lake Louise had the longest runs I had ever skied, amazing views, and trails I enjoyed. They are hard to compare but if you make me pick, Lake Louise Ski Resort won me over. It could be the clear day or the actual Lake and Chateau down the road that I was absolutely fawning over. Or it could be this spectacular mountain with its vistas, awesome terrain, and bison ramen. You'll just have to head to Alberta and let me know all the reasons you loved Lake Louise.